Windows バッチファイルの変数と引数 ← RootLinks Co., Ltd. NOTE: DOS does support more than 9 command line arguments, however, you cannot directly read the 10th argument of higher. This is because the special variable syntax doesn’t recognize %10 or higher. 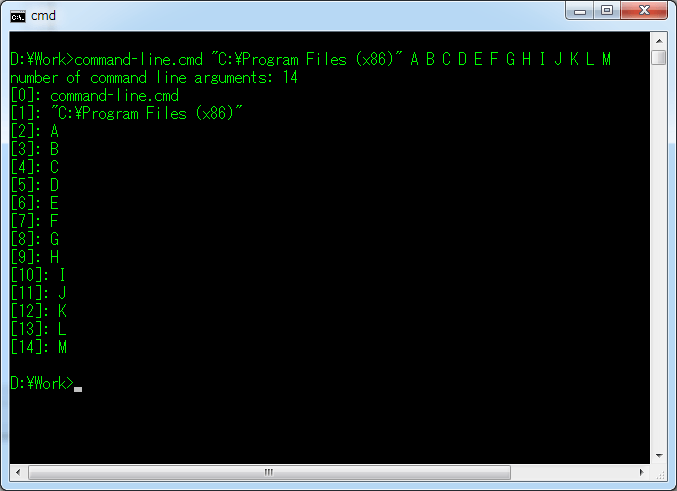 In fact, the shell reads %10 as postfix the %0 command line argument with the string “0”. Use the SHIFT command to pop the first argument from the list of arguments, which “shifts” all arguments one place to the left. For example, the the second argument shifts from position %2 to %1, which then exposes the 10th argument as %9.